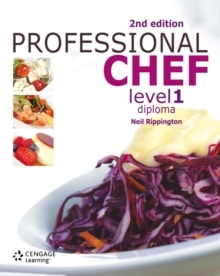 Professional Chef Level 1 Diploma, 2nd edition follows on from the extremely well received 1st edition and ensures learners have the foundation of theoretical and practical knowledge they need to start a successful career. This edition provides clear mapping to Level 1 VRQ units on the revised QCF while maintaining a clear, easy to follow style and the popular pedagogical features such as `Chefs Tips', Health & Safety and `Quality Points'. Building on the previous edition, this textbook boasts updated images and recipes, expanded information on careers and the catering industry, extended glossary and much more! For the complete blended learning solution this book can be used alongside Professional Chef Online which is designed to support students and tutors and make theory interactive and engaging. This solution offers a host of resources including quizzes, online games, a searchable eBook, bonus recipes, an interactive food map of the British Isles, and over 140 video master chef classes!